Eventually, even in New England, spring comes. With that, your lawn will go from its dormant state to spring growth. This time of frantic growth isn’t just limited to your yards: Spring is also a time for when insects come out of hibernation with an appetite. These critters can quickly cause discoloration and dead patches on lawns, and if left unchecked can completely devastate its health. 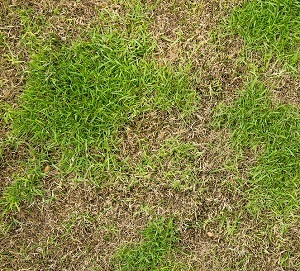 Today we’re looking at lawn damaging pests in spring and how to determine if you have them and which kind they are. As adults, crane flies resemble oversized mosquitos and are not a pest. However, in spring their eggs will hatch, producing larvae commonly known as “Leatherjackets,” which are wormlike, small, and brown. These young will feed on the succulent grass root throughout spring and summer. It’s important to catch them early, because in summer when they are reaching maturity their feeding will increase. Detecting European Crane Flies: Look for areas where your grass appears to be dying and cut and peel back a portion of the sod to inspect the roots. Look for leatherjackets, and check their concentration: as a rule of thumb, more than about 20 per square foot can cause lawn damage. Chinch bugs are very small insects that will go from reddish-orange with a white band when young to solid black when adults, but don’t grow larger than a fifth of an inch long, with many smaller (about 1/20th of an inch). Chinch bugs tend to go after lawns in sunny areas and inject grass with toxins that cause the roots to loosen from the soil. Check for places of spotty patches and loose grass. Detecting Southern Chinch Bugs: While they can be seen by the naked eye, it can be challenging to spot them when they are not in a group. Try using the floatation test: take both ends off a metal can and press it down into the sod of the affected area. Fill with water and watch to see if any Chinch bugs float to the surface. Most commonly found in the Southeast of the United States, the mole cricket is known for burrowing into lawns, where it eats insects and decaying plant matter. The problem is, it also feasts on grass, particularly the roots and new shoots. They leave behind irregular-shaped brown patches of discoloration on the lawn, and the lawn will feel “spongy” when walked over. Detecting Mole Crickets: Mole crickets are about 1.5 inches long, so they can leave noticeable piles of soil when they burrow. Look for these holes or affected sites like those mentioned above. Pour a solution of 3 tablespoons dish soap to two gallons of water over the area and watch for their emergence. Look for the shovel like forearms that give them their name. We have an entirely separate blog devoted to the grubs of June Bugs and Japanese Beetles. Check it out here if you think your lawn may be infected by grubs: How To Get Rid Of Grubs. At Greener Horizon, we provide lawn care and landscape management to estates, multi-family housing, and commercial areas throughout Massachusetts and northern Rhode Island. If you’re having lawn troubles, contact us. We’ll help diagnose, treat, and repair your lawn.